More than 70 local children have paid a visit to Wandsworth Council’s first wildflower meadow at Furzedown Recreation Ground, Tooting, where they helped build a five star bug hotel. 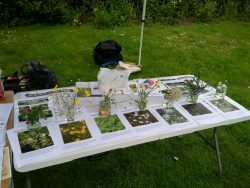 Organised by the newly formed Friends of Furzedown Recreation Ground, Wandsworth Council and Enable Leisure and Culture, the open day also saw families add new plug plants to the mix of flowers, identify insects and create chalk drawings of their wildlife discoveries. After seeds were planted in 2015, the meadow is now bursting with colour, including ox-eye daisies, tufted vetchs, pink and white campions and wild carrots. It’s also buzzing with pollinator insects such as bumblebees, carder bees and hover flies, many of which are now taking full advantage of the new hotel accommodation built be local children an volunteers. The meadow is made up of annual species which will be in full bloom throughout June and July, before going to seed in late summer, after which it will then be mown and cleared. It will then reappear each spring with a fresh burst of colour. “The meadow is a great success and will develop year on year. It’s already buzzing with insects and a big hit with local children and nature lovers. This is the first, and so far the only, wildflower meadow in a public park in Wandsworth and is free for anyone to visit. For location and opening times for Furzedown Rec visit the council’s website.